I would have to say that I’ve been a very busy spider throughout this summer. I was surfing the internet and came across this childhood book on www.babycenter.com (trying to find potty training materials). The book I came across is an oldtime classic “The Very Busy Spider” by Eric Carle. The first thing that passed my mind was “I’m definitely a busy spider”. The plot of the story is about how determined the spider is to finish her web despite the constant plea of her friends to come and play. At the end of the tale she finally finishes her web and feels that she perservered and accomplished her goal of building her web. I have to admit from an adult standpoint I definitely feel like a busy spider minus the eight arms. The day rolls by so rapidly from the time I wake up in the morning. I do my best to get all the kids on schedule making sure they get their teeths brushed, eat their breakfast, make their beds, get dressed, and then finally if I’m lucky drink my coffee steaming hot. My day reminds me of rush hour in New York City, always on the go trying to get things done on time. By the end of the day, I get all the kids settled for bedtime, and I’m exhausted and tired from all the daily chaos. Once they’re asleep it’s finally mommy time. I make a bowl of popcorn, drink a glass of juice or soda, and sit on the sofa to watch my previously recorded weekly series (Thank God for DVR like a Tivo). The best part is that there’s complete silence; no screaming, whining, yelling, or constant chatter. The house is finally calm, and so silent that I am able to hear the tapping beetle outside my window on the cherry tree that lingers over my balcony, and the crickets singing within the grass. It’s a dream come true. I don’t think I ever appreciated silence so much until this summer. I have to admit this season has been full of many memories some of laughter, tears, and inner growth. I have learned alot about myself during this process of having all my four children under the same roof. I have been proud of how I have handled certain situations as a mother, but I have also noticed areas that also need great improvement. Some people don’t realize all the skills needed in being an exceptional parent. There are many logistics involved in raising one, six, or in my case, four children. Every child has his/her own personality. Some mesh well or in some cases tend to clash with the others. When it comes to rearing children, psychology plays a major role in dealing with everyday stresses. It may look easy, but in my opinion it’s the hardest job we will ever encounter in our lives. The struggle of being consistent with discipline and treating all your children fairly is a daily challenge that never ceases. I am a very busy spider whose work is truly never done by the end of the day. There will always be that toy to pick up, or that dish still sitting in the sink, or that extra load of laundry to be washed, and the occasionaly child nightmare that will keep you up in the wee hours of the night. I have really learned about time management not from my marketing experience but from a mommy’s POV (point of view). I have absorbed what patience entails. It’s not easy I’ll tell you that. There are days that I just want to pull out my hair, and lock myself up in the room and never come out. LOL… so it’s those days that have really shown me how far we can come with a little perserverance and patience. Unlike the story, I’m still spinning my web. I don’t know if I will ever finish it like the spider in the book. I do know that everyday, I do accomplish a little more in completing this masterpiece. At times, it may not be a noticeable accomplishment, but every detail counts. 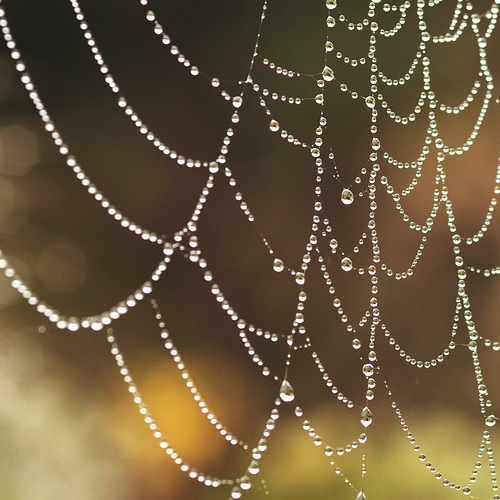 One day the details of this web will enhance not only its strength but also its beauty. I aspire to see it completed and view the progress made throughout the years. The time and effort put into spinning and sewing this silken design, to maybe see not only the fruits of my labor but to appreciate the journey that got me there. i guess this is the reason why motherhood has such a high status in the deen, nothing so rewarding can come easily. it seems like a very demanding job, i don’t think i could do it:( give me a class full of children that go home to someone else anyday. You are an awesome mom!! What UmAbdurrahman says? you mean if i be mom someday, i can’t read books? Oh my God! Really a mom is that much busy? Sis Shahrzad, OH NO sis.. this is jusst an expression to say that sometimes we have to give up what we like so much that our children when they are young can even keep us from remembering that you got to go the bathroom. LOL. No sis Shahrzad. I have found myself reading bits here and there of books. So I have prioritzed this summer. I guess our children need us in all moments. When they are younger children are all about them and so few moments in the day are really “ME” time. As sis sumayah expressed, that just to feel the quietness around when children are asleep gives you a pleasure that your days work has been completed. Insh’Allah sis shahrzad you will be an active mom too. insh’Allah things will settle down soon sis. Just hang in there and try to go with the flow and enjoy.